Ljungberg was signed by Arsenal in 1998 for £3 million, which at the time was the highest transfer fee for a Swedish player. Arsenal scouts watched him for over a year and Arsenal's manager, Arsène Wenger, took the unusual step of authorising the signing after watching Ljungberg play for Sweden in their victory against England on television, without seeing him play live. Seeing Ljungberg’s performance against England only confirmed to Wenger that Ljungberg could cope against English opponents, and he was signed shortly after. Ljungberg proved himself without difficulty and scored on his debut on 20 September after coming on as a substitute against rival club Manchester United, the match ending 3–0. 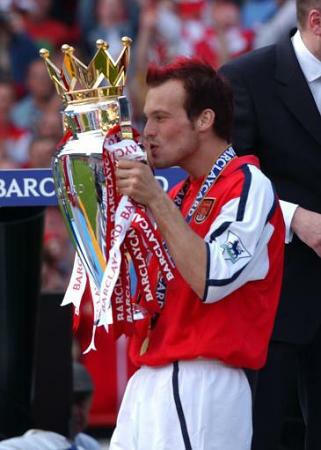 Some of Ljungberg's best form came in the second half of the 2001–02 season, when Arsenal won their second Premier League and FA Cup double. Following a knee injury to Robert Pirès, Ljungberg scored in most of Arsenal's remaining games, including a stunning finish for Arsenal's second goal in the 2–0 FA Cup Final win over Chelsea. 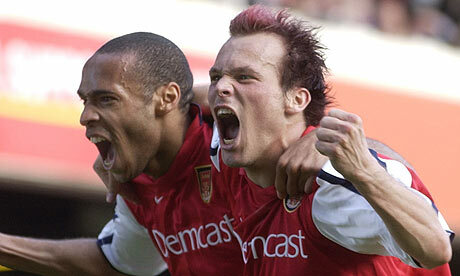 Ljungberg had scored many important and vital goals for Arsenal throughout the season. He scored an equaliser against Manchester United. Arsenal went on to win this game 3–1. He was instrumental in Arsenals 2–1 win against Liverpool at Anfield where he won a penalty in which Thierry Henry scored and then he slotted in a sweet finish from a Robert Pires cross. He scored an identical goal again Against Liverpool at Highbury 3 weeks later. The matched ended up being 1–1 draw. Ljungberg ended the 2001/2002 season scoring 17 goals in all competitions. 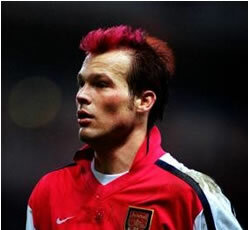 He endeared himself to Arsenal supporters by having a bright red stripe in his hair. (A popular chant spawned from this to the tune of "Can't Take My Eyes Off You" by Frankie Valli and the Four Seasons: "We love you Freddie, because you've got red hair, we love you Freddie because you're everywhere, we love you Freddie, you're Arsenal through and through" Later when he shaved his head this was updated to "We love you Freddie, because you've got no hair"). Ljungberg was the first player to score a goal at an FA Cup final outside England, when Arsenal lost against Liverpool in 2001 at the Millennium Stadium in Cardiff. A year later, against Chelsea, he became the first player to score in consecutive FA Cup Finals. He also scored a penalty in the shootout in Arsenal's 2005 FA Cup Final victory over Manchester United. He is most comfortable on either wing in midfield, though he can also play centrally in a 4–5–1 formation or as a second striker. Ljungberg became a regular in Arsenal's starting lineup following the departure of Emmanuel Petit and Marc Overmars in the summer of 2000. For several seasons he played a major role for the club including being a member of the unbeaten 49 game run for Arsenal. He had to fight with constant injury problems and occasionally severe bouts with migraines; in 2005 a persistent hip injury led to fears he may have contracted cancer, which were unfounded. It transpired that he was suffering from blood poisoning caused by his large tattoos. It was speculated in January 2007 that Ljungberg was being forced to leave Arsenal, after bosses became tired of a run of injuries restricting his play. "Ljungberg still has a lot to offer to Arsenal," Arsené Wenger said, on 13 January 2007, at a Blackburn Rovers pre-match press conference, stressing the fact that Ljungberg will stay at Arsenal until the end of his contract in 2009. Ljungberg:﻿ "I tried not to upset the AFC fans by going to West Ham instead of Spurs and Man Utd. It's a big shame RVP chose United." We called him "the hippie"